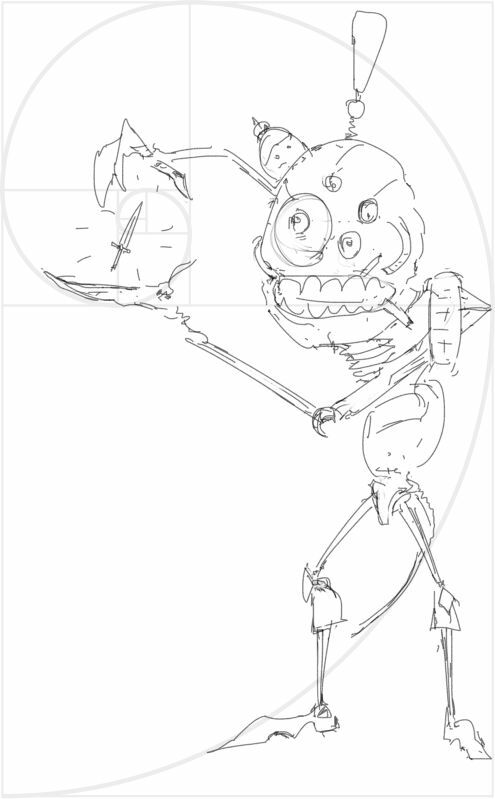 Anyways please be my guest and don't hold back on critique, I thrive on battleaxe-crushing crit. I made this because everything is better with doodles right ?? So I made this yesterday, It's pretty much anything goes, trying to generate ideas. I really want to draw more stuff like this today. I' draw a crimson dagger later.. with a tea bag. yeah. Great amount of creativity just need to see if the fundamental are there. Hey there Darktiste ! - Ah the fabled anatomy, tones, composition, shapes etc. studies. I used to do absolute TON of those couple years ago, think It might be time to refresh myself a bit because more than likely I've forgotten about half of it now :) Will certainly do some very soon. Here I've been working on a grim race for a world I've been worldbuilding for I-have-no-idea-how-long. Trying to get an overall feel for them in action poses. Oh and aand a very noble and majestic creature with a witty name. Nice start here Narog, like Darktiste has already said - great creativity :). 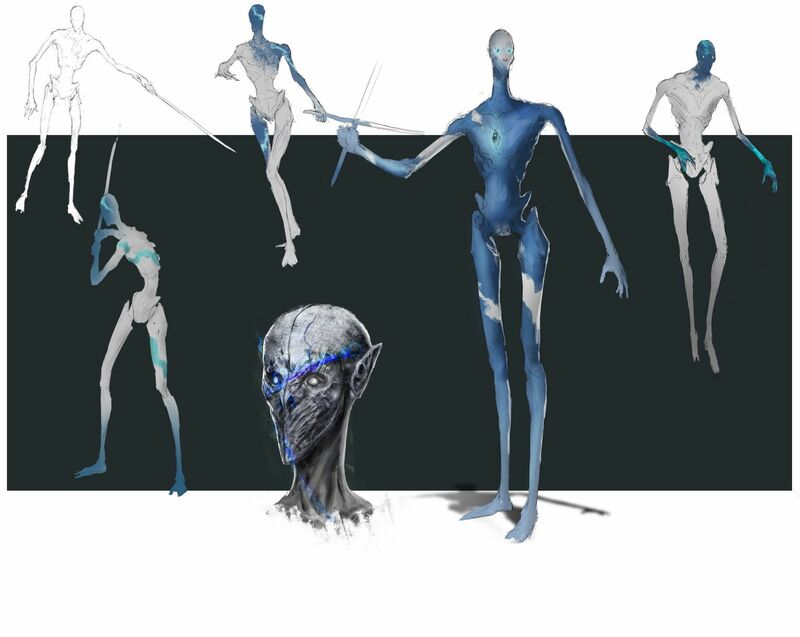 Nice creature designs, maybe check out some skeleton reference to get some more ideas? 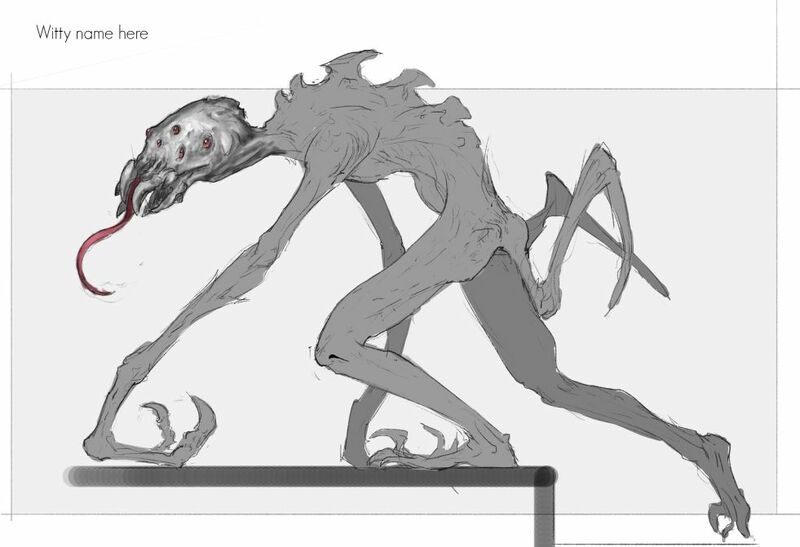 I like the last creature design, Narog I bet it will look even more amazing when its complete! Also I like the fact that you actually type out your ramblings instead of doing what most of us do and scribble it to the sides while working, I have so much advice from what I am listening to on the side or reminders of what I have to do on most of the things I work on but am too lazy to actually change to the text tool and type it out lol. Hey Mylqin - Well to tell the truth I never meant to finish this creature, but now I MUST. This forum is pretty motivating. 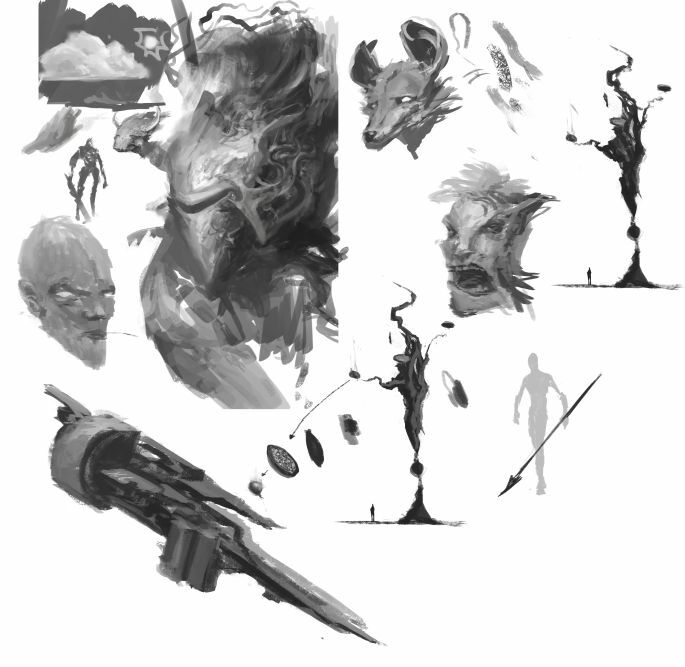 So here are some studies from photos (from here: https://line-of-action.com). It's really nice to just sit back, listen to some audio books and draw away. Working again on some props for an African - tribal style environment, It's pretty fun :D. Just got back to it after not touching this piece for a long time. Try to think about presentation the principle of composition also apply to presenting design. 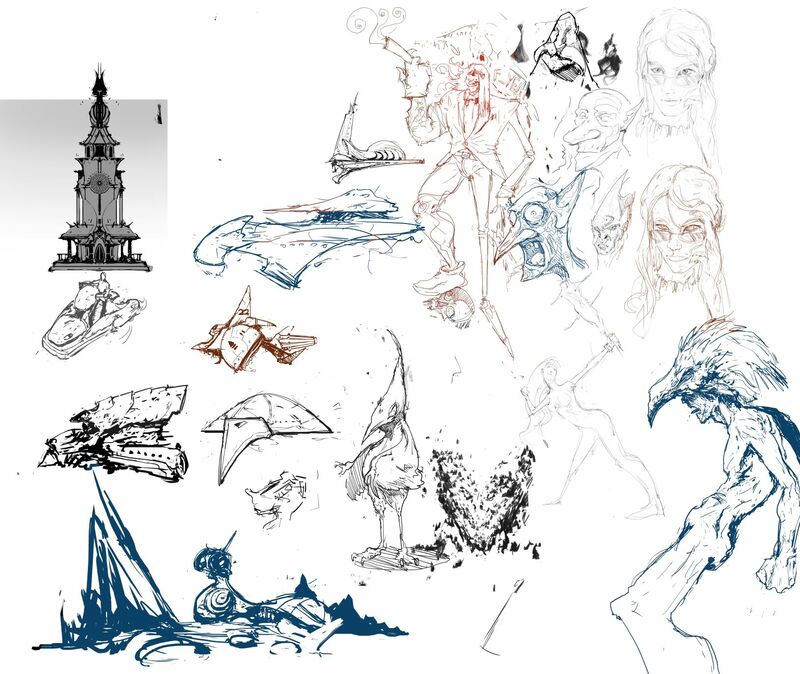 Hey Naroq, I love the style in your sketches, very expressive and fun! Is the african theme a part of your worldbuilding thing? I also really wanna see some photobashing-painting of yours, to really get a grasp of where you at and give you proper critique. Hey Darktiste ! - I need to work on my composition, if that's what you mean, I have a couple studies in mind after I deal with my extreme lack of photobashing skills. Hey -echo- ! - Yeah those sketches are just pure fun, no restraints ;). The african stuff is part of a series of concept stuff for portfolio. Now the photobashing ---> So I've had a couple of sketches of a sci fi character, nothing too demanding at first (I dont really know if he's a warrior, or engineer, his silhouette is not very recognizable from afar and the list goes on..), really needed to get my feet wet on basic photobashing. 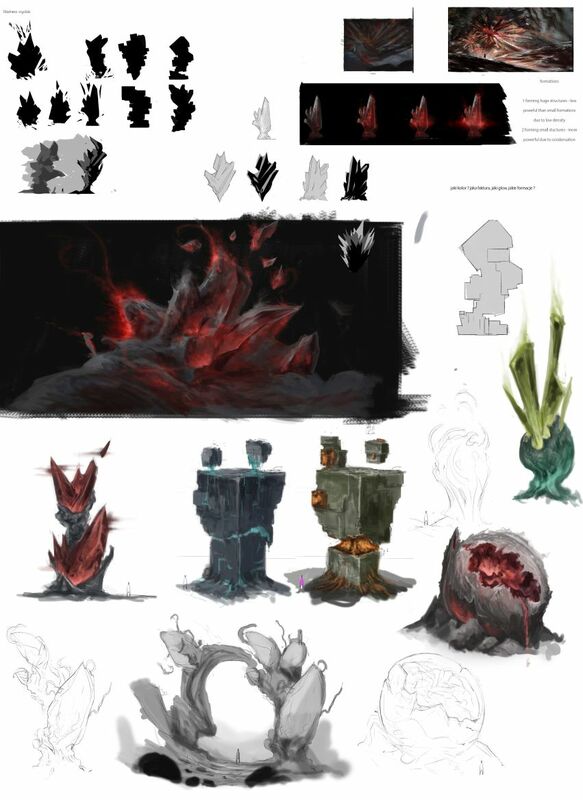 My main problem is that the sketch in the top left part is pretty different from the textured guy because I just couldn't find the right textures, it's like the design is more influenced by whatever i could scrap from the internet than what i really want it to look like. 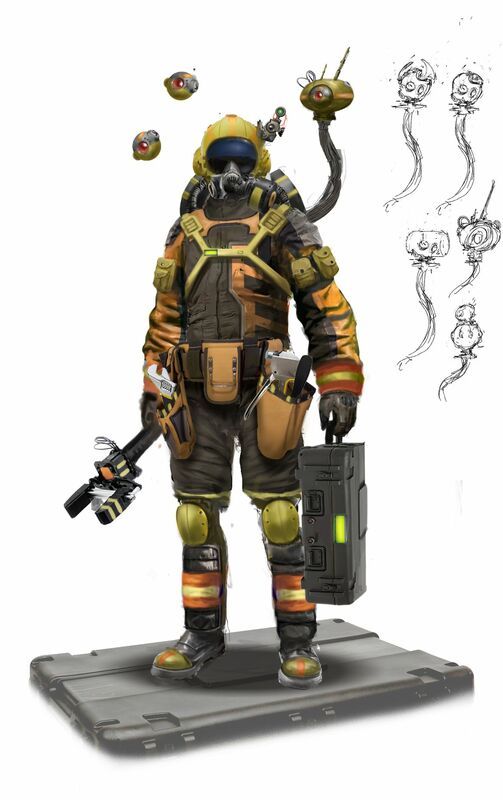 Also the pose and helmet design - Not happy about it. So I've mailed a guy ( Juan Novelletto ) and he told me that it should typically take you about 2-3 hours just gathering referance and proper photos. 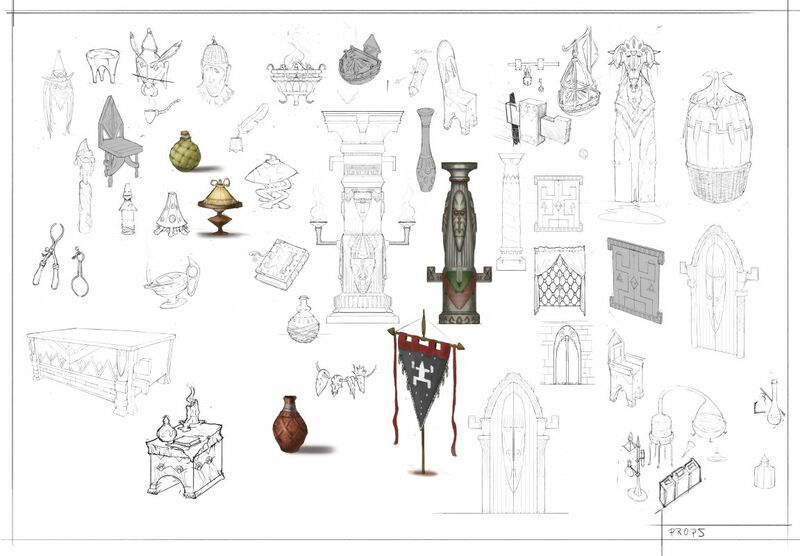 Even before that he does a list of what the character needs, his accessories, anatomy etc. Now after this not so good attempt I off to make a better one hopefully. 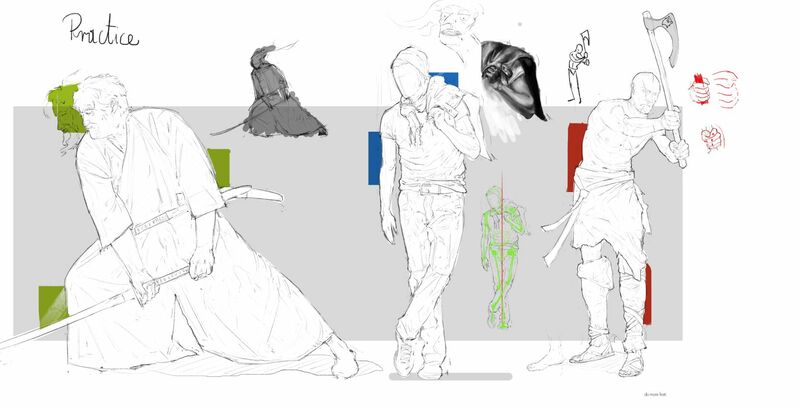 Some hint to improve those silhouette: pose, exaggeration and shape language. 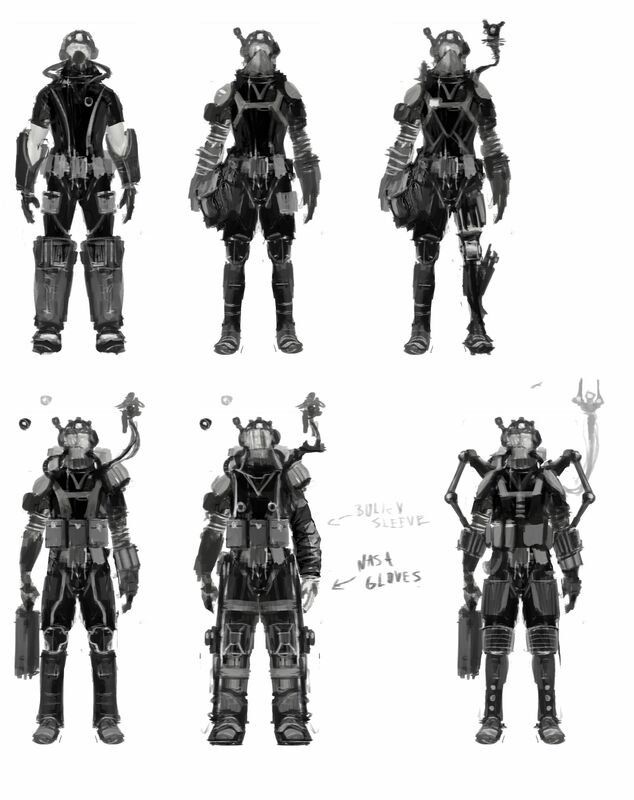 First I did some sketches of a Futuristic Engineer/mechanic working in hostile environment, vacuum maybe. The exoskeleton parts is something I'd love to do, but for now I've settled for a more basic design since It's all pretty new to me. Anyway If you know any nice websites with tons of free stock images (don't have to be high quality, sites like gettyimages are great for photobashing since the small free image is often enough) do let me know ! 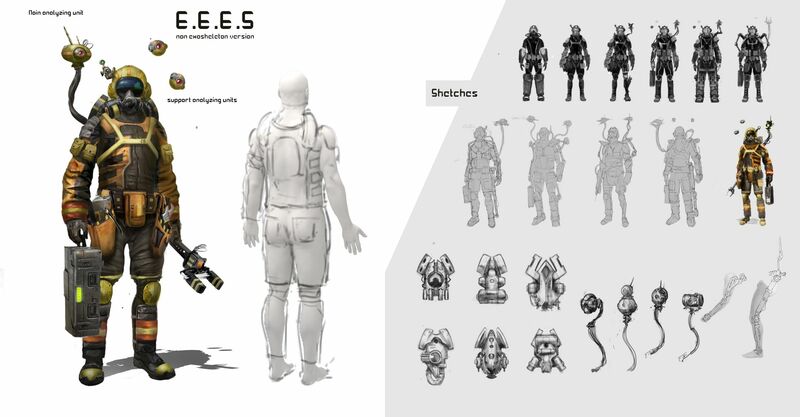 Designs is looking really, really cool on the last one I'm digging where this one is going, I love the black & white sketches! The thing about the wip-piece is at the moment it look too "copy-pasted" Especially the belt/stuff in his hands, while other parts looks too unfinished. In my opinion the photorealistic parts needs to be more painted and the painted stuff needs bit more texture to "meet in the middle", if you know what I mean? Also the light/shadows seems to need some work: There seems to be an overall ambient light but with a hint more coming from above. I think that the design would benefit if you choose an overall light source (maybe even two - with rim light), I think it would help with the credibility. (08-31-2018, 04:49 AM)-echo- Wrote: Designs is looking really, really cool on the last one I'm digging where this one is going, I love the black & white sketches! Thank you man ! I agree with everything you've wrote, the photo parts need a lot more work to get presentable. Rim light is very tempting, can't remember a scenario where it didn't look cool :). Time to get my hands dirty with photobash again ! The anatomy has issues, however. Compared to the rest of the body, the legs are tiny and short, same with the feet. In turn this makes the arms look much longer than they should. A nit-picky thing as well - even though this is just a sketchbook to fill how you want - it would be good to see a more refined presentation of your work. You have a lot of good pieces, but most of them suffer from the clutter of sketches around them or being on a canvas that feels claustrophobic and too small. 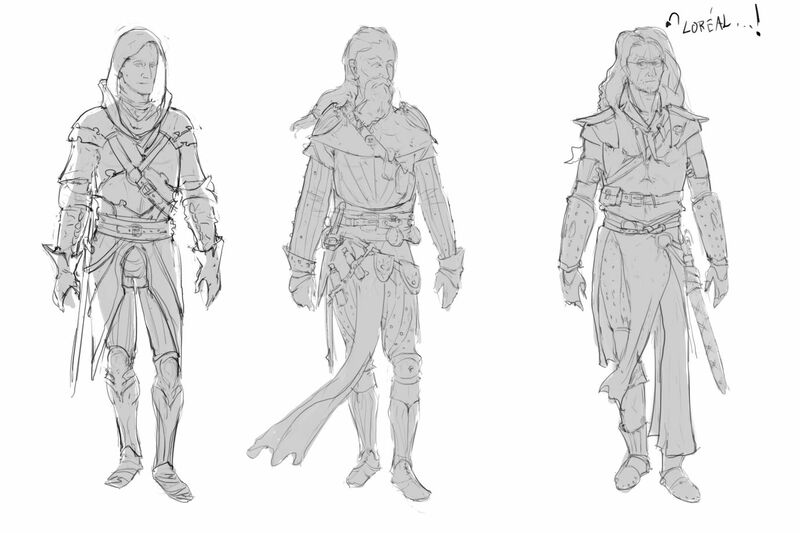 The first guy in the mage concepts isn't even coloured all the way. Again, it's just a small thing, but always thinking about presentation helps in the long run. Regarding the sketches presentation I realize i keep it kinda dirty and you're right I should atleast occassionally post something that reads better. My initial though behind a sketchbook was not to present my refined pieces but rather loose sketches, embarrassing mistakes, unfinished stuff. Experienced folk (like you!) are always able to see past the dirtiness and find flaw that I could not see which is why I really like this forum :). You know writing thoughts like this is a nice practice in itself - helps evaluate previous thoughts :D.
I also just made a presentation robot in a fibonacci spiral, may it serve me well in the future ! My today's warmup, I wish i could do more. Photobash stuff I've been doing lately, I hope to do more tomorrow. I have so many projects started it's a struggle to figure out what I should be doing next. The brain get bored of a project pretty quick but with multiple project atleast you have option but there also the option of alway starting more project and that not so good at the end because you still need to finishing project. 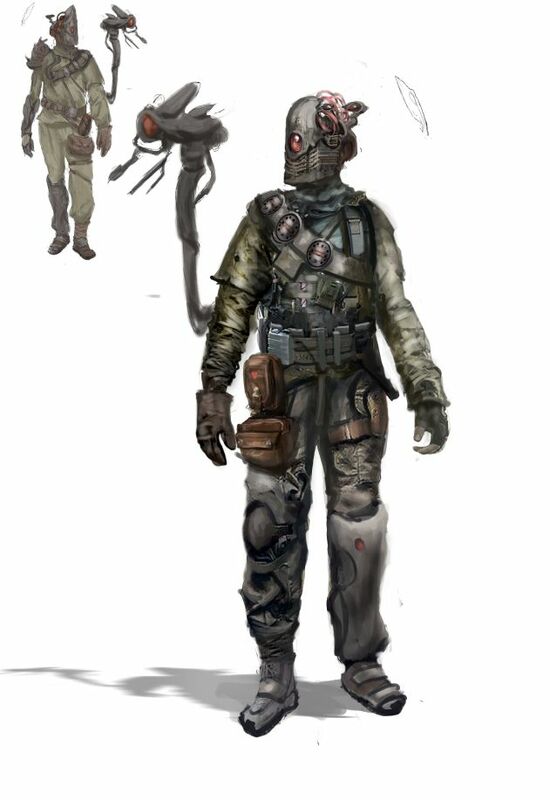 Would be good to finish the back of that character for example. Also there a difference between sketchy and sloppy.The difference is i wouldn't put a sloppy drawing in a portfolio. I would say the bigger a figure is the less sloppy it can be.This is why i think you want to retourch that back facing character in the last piece. If you show you can draw turn around you get better chance someone will hire you.